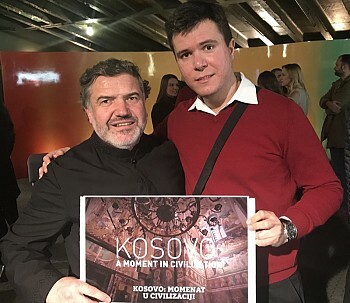 Recently, the documentary “Kosovo a Moment in Civilization,” by the Serbian filmmaker Boris Malagursky, was screened in major American cities. On Thursday, February 22, the film was shown in New York City. The theater was full of people, especially students, who were excited to see the film and eager to talk to Malagursky and participating artists. This documentary is especially impressive because of the security and safety concerns that faced the crew whioe filming in Kosovo and Metohija. The film portrays the beautiful Serbian spiritual and cultural legacy that has been in great danger in Kosovo and Metohija since the late 90s. Over the past two decades, more than 150 historical churches and monasteries have been destroyed. The history and the beauty of the holy Monsteries, the Patriarchate of Pec, Bogorodica Ljeviska, Prizren, Gracanica, and Decane are all testaments to Serbian spiritual strength and perserverance. Therefore, these firm fortresses strengthen the Serbian comitment to protect and preserve our Holy land of Kosovo and Metohija.